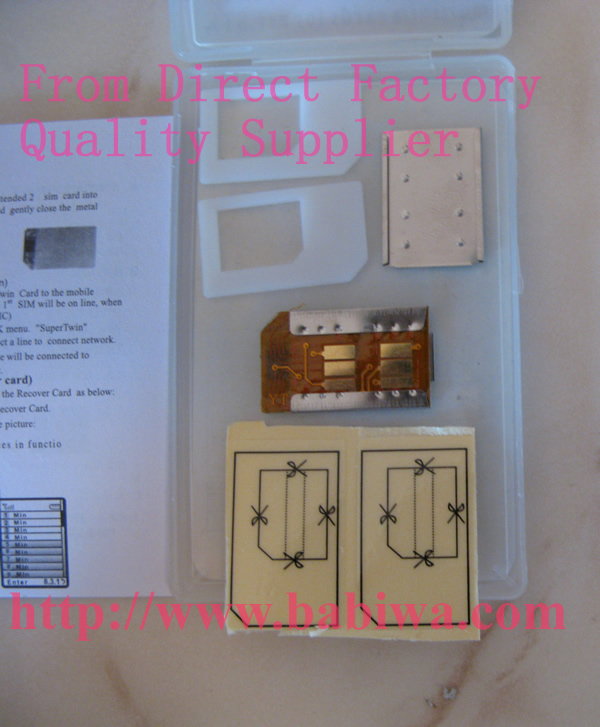 Genuine Cutting Version of QYG(Q-Sim) Two-Sim card Holder for Universal GSM Mobile Phone and Most WCDMA(3G UMTS)Mobile phones. This listing is for Q Series Cutting Type Version 4 for GSM and WCDAM(UTMS 3G)Mobile phone .We also provide QYG Cutting Type Version 7 for GSM Mobile phone ONLY. BW-2GC-7 : works for gsm simcards only. 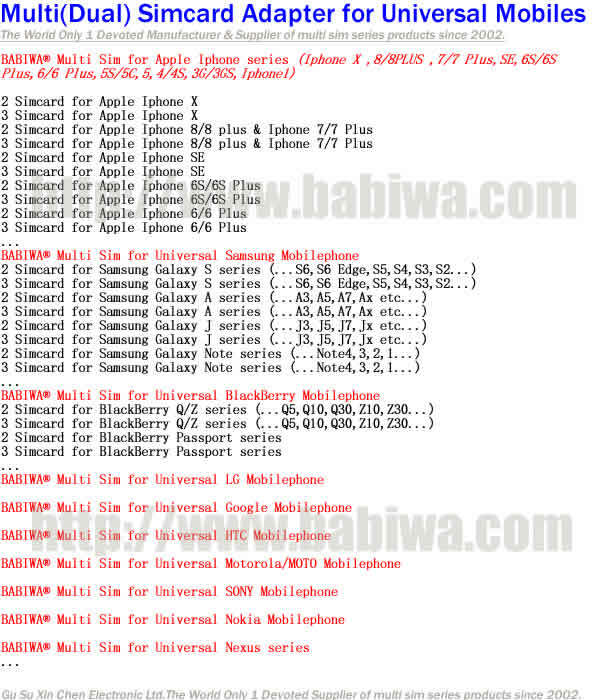 BW-2GC-4 (this listing):works for gsm and wcdma(utms 3g) simcards,but wcdma(utms 3g) simcard is running on 2g mode,it doesn't support 3g rate data transmission. 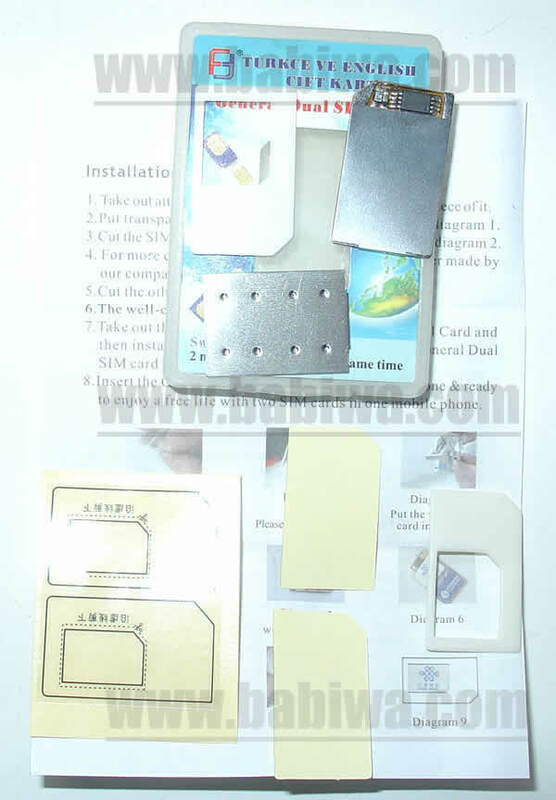 Please Notice this is cutting Version of Dual Sim Card Holder,Let Universal GSM and Most WCDMA(3G UMTS) mobile phones get two sim cards installed for your convenient and easy choice.You don't need to power on and off to change sim card as before ! You can easily switch between two SIM cards in your Phone or Let two Numbers switch automatically(Based on the auto-switching time that you set up). and It's Different from our classic dual sim adapter only for Universal GSM network . 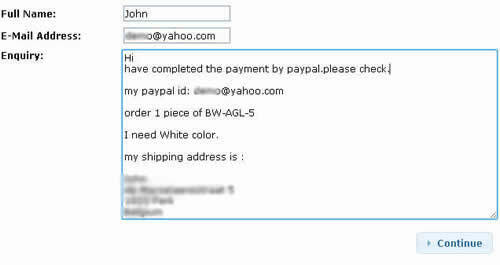 1.you can conveniently choose any one number online,but Not both numbers online at same time . 2.This dual sim adater is not for Apple IPHONE SERIE.You could refer to our other ebay listing for Iphone dual sim adapter. 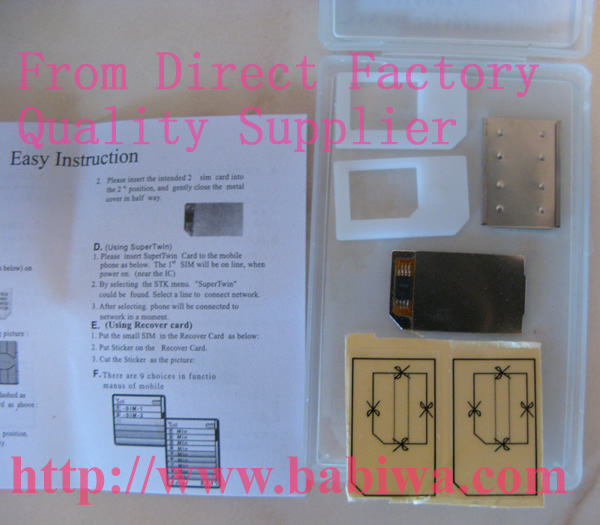 3.This adapter is Cut version,You need to cut the sim card as instruction,it's very easy with scissor).We also provide Cut version of dual sim adapter only for gsm network,you could refer to our other ebay listing. 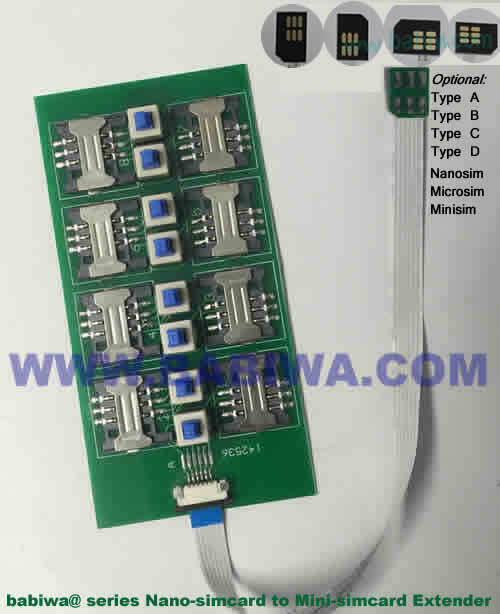 4. please also make sure your Mobile phone could install this adapter into your simcard socket(this adapter is same size of normal sim card,but A little thicker,some new model maybe not able to hold it into the sim card socket).if you are uncertain,please check your phone before buy .thanks. even if you use 3g simcards !! (1).Unique technology to let your own mobile phone to install two sim cards -- You don't need to power on and off the mobile phone to switch the both numbers(sim cards),just switch SIM(both phone number) online through "SIM Tool Kit" .And the "AUTO SWITCH"feature enable you to Set Two sim cards to be online automatically . please notice you can conveniently choose any one number online,but Not both numbers online at same time . (2).Compatible with Almost all of GSM mobile phones most WCDMA(3G UMTS) phones.We have been selling a lot in worldwide area(US,Ca,Europe,Australia,Asia...),But not for Iphone series.some other Network simcard maybe find the compatibility problem too. This is cut version,you need to cut your sim card with common scissor. please make sure your mobile phone could hold the adapter(the cut version adapter is the same size of normal sim card,just a little thicker,from our experience,most of universal mobile phone could hold it without any problem,but some new model couldn't install this adapter into the sim-card socket.so you'd better to check it before order.if you do feel uncertain,please don't buy.Thanks.